Why would a doctor order a PCR (polymerase chain reaction) test? Polymerase chain reaction (PCR) is a technique that is used to amplify trace amounts of DNA (and in some instances, RNA) located in or on almost any liquid or surface where DNA strands may be deposited. The key to understanding PCR is to know that every human, animal, plant, parasite, bacterium, or virus contains genetic material such as DNA (or RNA) sequences (nucleotide sequences or pieces of DNA or RNA) that are unique to their species, and to the individual member of that species. Consequently, if a sample contains segments of DNA or RNA, PCR is a method used to amplify (make many more identical copies) of these unique sequences so they can then be used to determine with a very high probability the identity of the source (a specific person, animal, or pathogenic organism) of the trace DNA or RNA found in or on almost any sample of material. PCR amplification is only part of the identifying test, however. Once the amplification is done (see below), the amplified segments need to be compared to other nucleotide segments from a known source (for example, a specific person, animal, or pathogenic organism). This comparison of unique segments is often done by placing PCR-generated nucleotide sequences next to known nucleotide sequences from humans, pathogens, or other sources in a separating gel. Electrical current is run through the gel and the various nucleotide sequences form bands that resemble a "ladder" according to their electrical charge and molecular size. This is termed gel electrophoresis. Bands or "ladder" like steps that migrate to the same levels in the gel show identity of nucleotide sequences. This method is one of the most popular ways PCR tests are completed (See Fig 1). Figure. 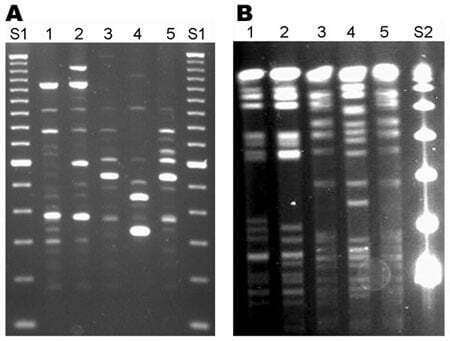 Repetitive element (Rep)–PCR (A) and pulsed-field gel electrophoresis (PFGE) (B) patterns of Mycobacterium cosmeticum isolates from 2 patients in Ohio and 1 patient in Venezuela. Rep-PCR was performed by using BOXA1R primer (3), and PFGE was performed with restriction enzyme AseI. Lanes 1, 2, Ohio isolates OH1 and OH2; lanes 3, 4, control strains ATCC BAA-878T and ATCC BAA-879; lane 5, Venezuelan isolate VZ1. DNA size standards are 100-bp (S1) and 48.5-kb marker (S2). A large excess of DNA building blocks termed nucleotides (Adenine, Thymidine, Cytosine, and Guanine, abbreviated as: A, T, C, and G, respectively) are present in the solution. When these blocks are linked together, they form a nucleotide sequence or a single strand of DNA. When these building blocks bind their complementary building block by weak hydrogen bonds (for example, A will only bond with T and G only with C) a complementary DNA nucleotide sequence is formed and bound to the original single-stranded DNA. When the binding is completed, a complementary double strand DNA is formed in a specific sequence. PCR, then, begins with a segment of DNA from a sample that is placed in a tube with the reagents listed above. The solution is heated to at least 94 C (201.2 F); this heat breaks the hydrogen bonds that allow complementary DNA strands to form, so only single strands exist in the mixture (this is termed denaturation of double-stranded DNA). The mixture is allowed to cool to about 54 C (129.2 F). At this temperature, the DNA primers and DNA polymerase bind to individual single-stranded DNA (this is termed annealing of the DNA). Because the building blocks are in excess (high concentration) in the mixture, the polymerase uses them to make new complementary strands of DNA (termed extension of the DNA) and this process is more rapid at 72 C (161.6 F). This process creates a new double-stranded DNA molecule from each of the single strands of the original molecule. This cycle is repeated about 40 times in a machine termed a thermal cycler that automatically repeats the heating-cooling cycles, with the amount of each DNA sequence doubling each time the heating-cooling cycle is completed. What initially was a single short segment of DNA can be amplified to about 100 billion copies after 40 doubling cycles. The PCR test forms the basis of a number of tests that can answer many different medical questions that help physicians diagnose and treat patients. For example, PCR tests can detect and identify pathogenic organisms in patients, especially those that are difficult to cultivate (for example, HIV and other viruses and certain fungi). Other doctors order PCR tests to help diagnose genetic diseases, while other doctors use PCR to detect biological relationships such as identifying parents of children. PCR tests are also used to identify and characterize genetic mutations and rearrangements found in certain cancers. However, PCR tests have been modified and extended into many aspects of scientific investigations including evolutionary biology, genetic fingerprinting, forensic investigations, and many others. RT-PCR is a PCR test that is designed to detect and measure RNA. Although initial PCR tests amplified DNA, many viruses and other biological components (for example, mitochondria) utilize RNA as their genetic material. RT-PCR differs from conventional PCR by first taking RNA and converting the RNA strand into a DNA strand. This is done by essentially the same method for PCR described above with the exception of using an enzyme termed reverse transcriptase instead of the DNA polymerase. The reverse transcriptase allows a single strand of RNA to be translated into a complementary strand of DNA. Once that reaction occurs, the routine PCR method can then be used to amplify the DNA. RT-PCR has been used to detect and study many RNA viruses. RT-PCR should not be confused with another variation of PCR, termed Real-Time PCR. Real-Time PCR is a variation of PCR that allows analysis of the amplified DNA during the usual 40 cycles of the procedure. Although the procedure is similar to conventional PCR with cycling, Real-Time PCR uses fluorescent dyes attached to some of the building blocks or small nucleotide strands. Depending on the method used, fluorescence occurs when the amplified DNA strands are formed. The amount of fluorescence can be measured throughout the 40 cycles and allows the investigators to measure specific products and their amounts during the amplification cycles. This often allows investigators or lab technicians to skip the gel electrophoresis or other secondary procedures needed for analysis of the PCR products, thus producing more rapid results. Real-Time PCR and RT-PCR are variations or modifications of the original PCR test. However, there are many more variations (at least 25) that exist and are used to solve specific problems. They all have different names such as Assembly PCR, Hot-start PCR, Multiplex PCR, Solid-phase PCR and many others. PCR is likely to continue to be modified to help answer any other questions in medicine, biology. and other fields of study. MedTerms.com. PCR (polymerase chain reaction). CDC.gov. Mycobacterium cosmeticum, Ohio and Venezuela. Mullis, K. The unusual origin of the polymerase chain reaction. Scientific American. 262 (4): 56–61, 1990.